Description: Inspire yourself with the beautiful and traditional Moroccan fashion to dress up this lovely model. With ruffled attire and raven hair this flamenco dancer carelessly captivates and entertains. Style her in traditional flamenco skirts and gowns! Explore the splendor of Indian fashion and help Mumtaz getting ready for a photo shoot. 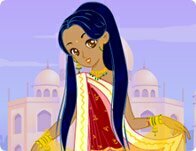 With a silky sari, beautiful beads, and gossamer veils, this Indian princess will bring fashion and honor to her family.